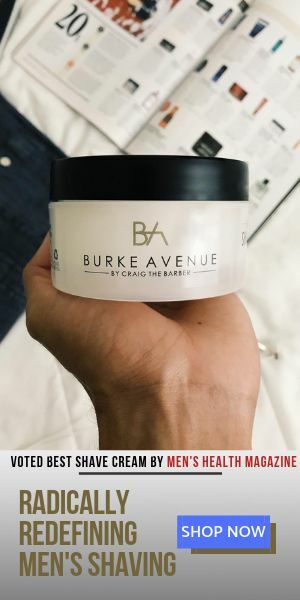 More and more barbers are trying their hand at their own product lines. And for what it’s worth, I completely support it! After all, who knows shaving products better than the people who use them on a daily basis? Enter Master Barber – Iain Kane, creator of The Village Barber product line. Currently comprised of two items essential in achieving a comfortable shave – the Shaving Oil and the Pure & Natural Aftershave Balm. With over 30 years of experience in the field of barbering in the United Kingdom, Iain created two great products. However, since the “Product of the Month” title can only be given to one of the two, I chose the Pure & Natural Aftershave Balm, for it’s truly noticeable skin calming properties and amazingly subtle fragrance! An aftershave balm is the key component in assuring that freshly shaved skin is properly healed and moisturized. And, the Village Barber has successfully accomplished that! All natural, chemical/paraben free and filled with more essential oils than I can count, is what gives this aftershave balm my seal of approval! I was lucky to stumble across Iain’s Barber shop 4 years ago. For 3 years I have looked at his products on a display shelf whilst waiting for my hair to be cut. After so long looking at them, I tried the saving oil. 6 weeks later I went back for a hair cut and had to try the aftershave. It honestly is the best shaving experience I have found and people actually notice the difference!! I suppose the moral of the story is: Don’t wait too long to try something because you may just be missing out!! Glad your shaving experience has greatly improved. Welcome to The Shaving Revolution, my friend!